The Nestle Vivonex RTF Elemental Diet Unflavored Liquid 8oz Case of 24, Model #36250000, is anchored in advanced science and research. Nestle Healthcare Nutrition offers nutritional solutions for people with specific dietary needs related to illness, disease states or the special challenges of different life stages. The Nestle Vivonex RTF Elemental Diet Unflavored Liquid 8oz Case of 24 is designed for people who have severe GI disorders. 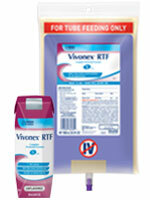 Vivonex RTF is nutritionally complete and is 100% Free of Amino Acids. 100% free of amino acids for severely compromised GI tracts. Only 10% calories from fat to support tolerance and reduce pancreatic stimulation. Useful in stressed, catabolic patients. Requires minimal digestive functionality for assimilation while providing benefits associated with continued use of the GI tract. Can be used for tube feeding or as an oral supplement. Closed system with SpikeRight PLUS port, the first available proximal-end enteral connector system designed to be incompatible with I.V. equipment.